popular video games. Cassie was quite impressed with the construction of the balloon, ?The balloon is made quite well and has welded seams that help it stay inflated. 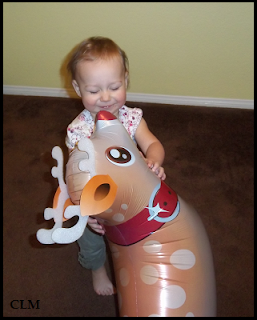 I honestly thought the first time my daughter went to hug the balloon, it was going to be a goner, but it has held up to her hugging, kissing, and yes she even nibbled the reindeers tail,? she said. Cassie was thrilled to have such a fun and creative toy for her daughter on Christmas morning she even thought of getting one for her husband to keep at work to remind him to relax and have a little fun. To read the full review of My Own Pet Balloon, check out In Random.